I removed the side panel of our server rack so I can clean up some of the wiring. Inside I found the PDU was wired like in the picture. Instead of an incoming power cable, there's just 3 uninsulated spade connectors. Is there any reason for wiring it like this instead of using a C19 to appropriate connector for your country cable? Or did whoever do this just not have the right cable handy, and figure this is good enough? When I say uninsulated, the metal parts of the spade connectors do look completely bare. I haven't looked too closely to see if there's clear insulation or something, but it doesn't look like it, and it's live. Proper cables are being dropshipped and will be installed as soon as they arrive. In the mean time nobody is going to go anywhere near it. I can easily cut power to the PDU so replacement wont be a problem. The cable to the PDU has been replaced with a proper one. No electrician needed. No fires, no injuries. Yay! The faulty cable has been destroyed so nobody ever gets tempted to do something like that again. For extra damage, the cord they attached those spades to was only an 18 gauge cable, not the 14 gauge ones usually used for servers. That's shockingly bad (sorry!). If that cable gets yanked out by someone, at the very best it will short out and hopefully trip the circuit breaker, possibly taking out power in other racks or even other parts of the building. Worst case, somebody could be killed. Carefully secure the rack. Lock it up, post a notice to admins to not touch it under any circumstances. Make sure people are aware there is a dangerous electrical fault within the rack. If you have a server failure, so be it, that is too dangerous for anyone but a trained electrician to go near it. The stakes are too high. Call a professional registered electrician to fix that. Plan for downtime whilst the electrician does what's needed. Find out who was responsible for that, and if they are still employed, report them to management, as they should be severely disciplined for putting other people at risk. I'd worry about that. When you say uninsulated, do you really mean those are live and unprotected? If so, that's not safe. Find an electrician to help, and stay out of there while you do it! That is a fire (or electrical accident) waiting to happen. Nothing good can come of that. It is negligent and noncompliant and most definitely not normal. I'd imagine it wouldn't be a fun thing to try and explain to an insurance company either, in the event. I can imagine a dozen different scenarios in which that connection becomes a disaster either to uptime, property, or safety. You need to disconnect the power above that connection immediately (eg. the other end of the cord). I personally wouldn't bother with an electrician just to unplug the other side of that, assuming the other side isn't just as much of an atrocity and also assuming that there isn't some other circumstance making that dangerous. If you want to be extra cautious (it never hurts), wear some electrically insulating gloves and get a voltage tester (designed to test for mains current) to ensure that the leads on the jerry-rigged side of that cable aren't live. Once there isn't any current in that system, if you feel safe doing so, carefully remove those blade connectors (if they will slide off), or better still, remove the PDU from that environment and seperate the cable from the rest of the assembly elsewhere. Destroy the plug on the other side of that cable and throw it away. It's a great pity you can't track down whoever is responsible for it; they need a stern lecture from a fireman. Absolutely do not leave this with current running through it! Can you imagine what might happen if a metal object were to fall in there, connecting that mounting rail to mains current, or something? Even if you cordon that thing off it's not safe. Even supposing there was a thin coating of some insulating substance in there, that wouldn't be nearly enough to protect it from all the things that might occur. It would be better for you to run without the redundant power source than for you to allow that to continue to exist in your environment. I would even sooner move the equipment to another rack (if that isn't a redundant PDU) than leave that in place. This has to be rectified very soon! Those spade connectors are not designed for the amperage that could potently be drawn should all of the connected devices require full load. Also the earth will not be sufficient should there be an issue. Please please please plan urgent downtime NOW! 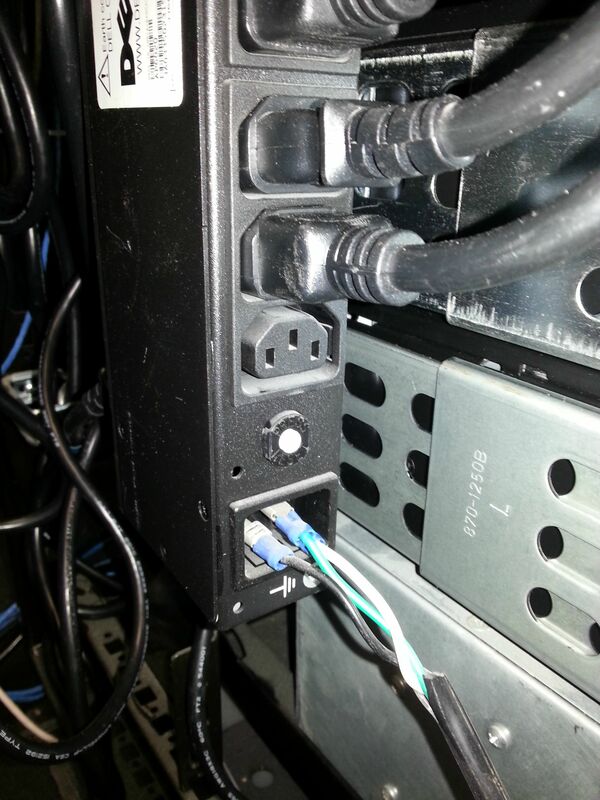 Isolate the power to the PDU and replace with the correct cable. This is a huge safety issue and needs sorting, sod downtime. The cost of a law suit will be more. Are you sure, these are really powered lines and not just the grounding, going to the earth-leakage-switch ? (okay, that should be isolated, too, just for safety, but it shouldn't carry any power for more than a few ms - then the ELS will cut off). Not the answer you're looking for? Browse other questions tagged power-distribution-unit electrical-power safety or ask your own question. What is this very short power cable called?